Remember how cool we thought the future looked in “Minority Report”? We watched in awe as Tom Cruise, decked out in all-black, controlled rapidly moving 3-D images simply by waving his hands in the air. Unbelievable – at least it used to be. 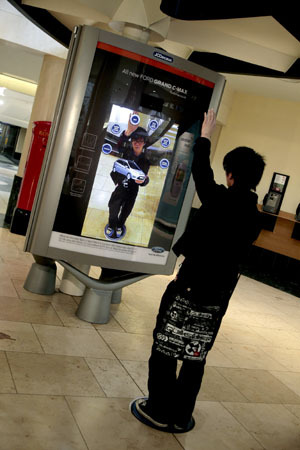 Ford of Britain launched kiosks with similar technology this week in shopping malls to help introduce consumers to its seven-seat Grand C-Max car. The campaign allows people to handle miniaturized 3-D virtual models of the cars in the palms of their hands via giant interactive screens. London-based Ogilvy & Mather partnered with Grand Visual, a digital-production company, to launch the campaign, allowing users to interact with the cars by simply holding their hands up to the screen. Virtual buttons allow the user to choose car colors, open doors, fold seats flat, rotate the car and watch demos of key features. Rather than using a printed marker or symbol as a point of reference for interaction, the user interface is based on natural movement and hand gestures, allowing any passerby to immediately start interacting with the screen content. “It’s eye catching, intrusive, groundbreaking and brings to life the idea of ‘Innovation in your hands,'” said Andy Dibb, associate creative partner with Ogilvy. A Panasonic D-Imager camera accurately measures the users’ real-time spatial depth output and augmented reality software merges this real-life footage with the 3-D photo-real Grand C-MAX on screen. As of now, this technology is only available in the UK. Emma Bergg, news manager of Ford, said she isn’t aware of any plans to bring it to the United States, which is too bad if you ask me. We Americans want to play, too. Come on, Ford USA. Bring it on.